A week ago, during a dark night, a rainstorm didn’t just rain, but swept sheets of water across the deck. Recording a peak rain rate of 140 mm/hour, or almost half a foot of water, we think the ship was thoroughly washed. Yesterday we had a rare half-day of clear skies, instead of the usual hazy cover of humidity. Clouds quickly grew in the morning, sheared and swept away by the surface southwesterly monsoon winds. The wind and waves have been weakening over the past couple days, though it is still not calm. Graduate student G.J. sees a rain-squall approach. Chief Scientist E.S. attempting to connect to an ADCP instrument. Laptop sheltered from the rain. The rain is welcomingly cool. Do you picture the tropical seas as placid glassy surfaces? Not quite what we are seeing! The Monsoon “waves” or oscillations appear in 10-14 day active periods where rain can be heavy, sky very cloudy, and winds intense. In between are somewhat longer periods called “break” periods where rain is much less, its sunny and hot, and winds can often be low. Well, we certainly have been in an active period for last 3-4 days, and will remain active till about June 13-14th here in the Central Bay of Bengal! We are near 14°N, 88°E . The winds have been consistently hovering around 30 knots (30 nautical miles per hour is about 54 km/h) with occasional wind gusts of 50 knots (90 km/h). The wave heights have been above 6 m almost all day today, touching 7 m. Those are some significant numbers – a 7m wave height is about a 21feet high wall of water. The ship rides very well, and the scientists and the crew are in good spirits. Two days ago we saw a rain squall which lasted for maybe 20-30 minutes with a rain rate exceeding 140 mm/hour at the peak heavy rain! In other units = drenched in 5 seconds. This is all good news in terms of the scientific data we are collecting. 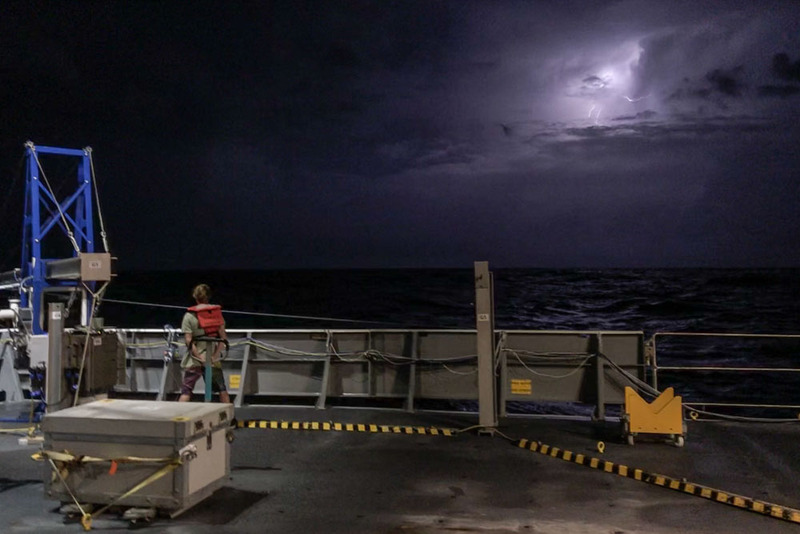 It’s hot all the time on deck, and for an instant in a bolt in a cloud, hotter than the sun. How fast are the winds blowing, high above us? How warm are they, and how much moisture do they carry? The best way to find that out is with a balloon! We attach a thermometer, a humidity sensor, a GPS tracker, and a radio antenna (all integrated in a small lightweight box) to a helium-filled balloon, and release it. The instrument (called a radiosonde) rises up ~300 meters every minute, into thinner and colder layers of the atmosphere, often reaching up to 20’000 meters (65’000 feet) above us. The high-quality latex balloon expands up to 4-5m across, before it eventually pops! (and invariably falls somewhere..). The sonde transmits data, valuable especially over the oceans, back in real time. Cable management makes E.H. happy. Unlike him, the instrument tower is fully waterproof. Nighttime deployment of the buoy, attaching the various components and instruments to the line, such as the x-wings, while curious spectators watch from a safe distance. Drive-by the next day, buoy looking good!